French Model Railway: eBay triumph. Perhaps "triumph" is the wrong word, but when your bid is successful in an eBay auction they email you with the message "Congratulations. You have won." or something similar. Anyway, I can't be bothered trying to fit that DCC chip into the loco so I'll report on this auction. 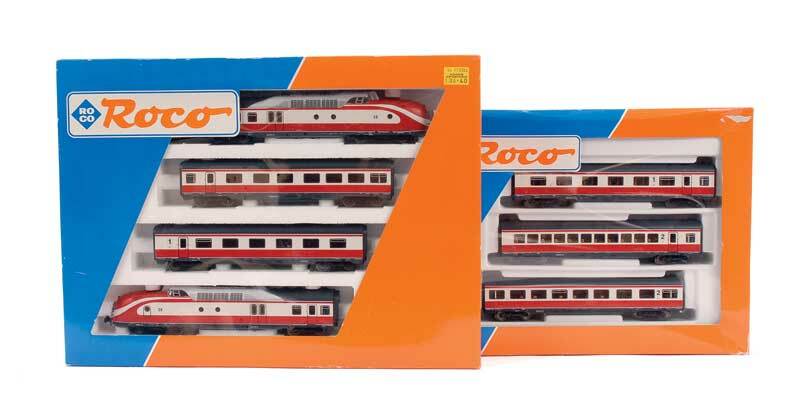 The dilemma that faced me was (as I reported in an earlier blog) that I had purchased the wrong set of carriages to complete my model of the Trans Europ Express. The latter's locos and carriages belonged to an earlier incarnation of the TEE. I won't re-outline the dilemma but basically I had decided to resolve it by selling the new set of carriages on eBay and then search around the internet for the correct set. But being lazy, I decided to look for the replacement set now and leave the selling of the wrong ones for another day. 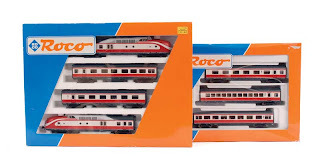 After a considerable search I discovered a second-hand set of three carriages on the Netherlands eBay site. I've bid for stuff on eBay before and what I really like about it is that it is a secret auction and you don't, as a bidder, get driven higher and higher in your bidding by trying to fend off your rivals. You decide how much you are willing to pay - in my case 85euros - but on the auction site is presented a much lower figure - one that is just a couple of euros higher than the existing highest bid. So the existing highest bid was 20euros and my bid caused this to rise to 22.5euros. There were 11 bidders and the second highest bidder was only willing to go to 50 euros. And this is the bit that I like - I didn't pay 85 euros, eBay adjusts my bid to a couple of euros above the second highest so I get the carriages for 52.5euros. A real bargain if they arrive safely AND are the right ones this time! This is what I should end up with. And this is a youtube video of a lucky chap (or chappess) who has the complete set up and running. There are quite a few of these videos on Youtube and most are accompanied with a soundtrack by Kraftwerk - but not this one, I'm afraid.